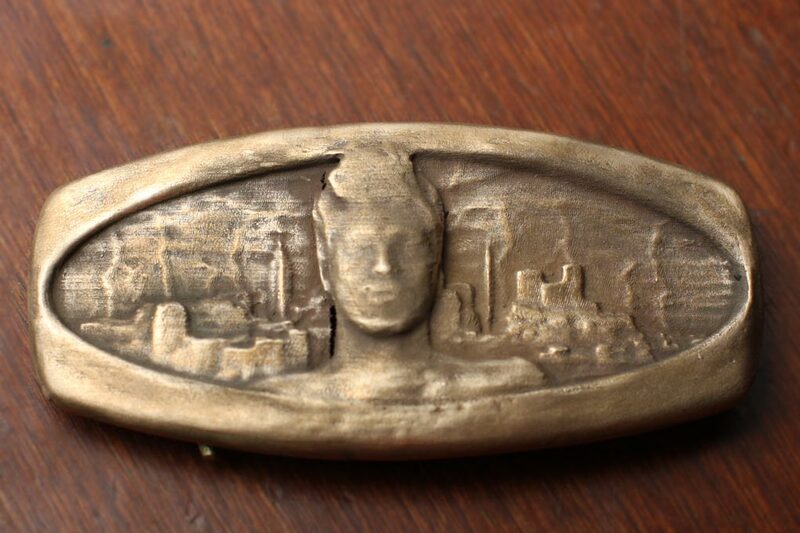 I’ve been working on this bronze belt buckle for about four months now. A while for a simple belt buckle perhaps, but this one proved not so simple. I had been looking for a way to improve my bas-relief sculpting skills for a while and this proved to be a perfect challenge. So what started out as a simple decorative design soon turned into full sculptural relief. After coming up with the basic design, came a half dozen digital versions, before I spent days refining the final digital model. After that began a series of attempts to print the model. At around 11 hours for the final print, it was by far the longest that I have successfully completed yet. There were a number of print failures and several digital revisions before I came up with a fully functional physical model. The next step was to mold it in silicone rubber. The mold-making challenge is not minor, as it presents opportunity to lose or deform some of the fine detail that I have spent hours creating. I got a pretty good mold this time, with only a few small air bubbles. In fact, the silicone creates such an accurate impression on the metal clay that the final air-dried metal clay model shows the intended fine detail, as well as small mold imperfections and artifacts of the 3D-printing process. When the model is air-dry I sand and file it to take off the rough edges. Then I polish selectively with water, with a fine paint brush and rubber tipped clay tools to remove artifacts from the 3D printing process. These include layer lines as well as the extremely fine patterns created by the X and Y axis stepper motors. The infinitesimally small movements these motors make appear smooth to the naked eye, drawing what appears to be a circle (for example). In reality, that circle is stepped. It is drawn by two motors, each of which moves on a linear axis. This is not much of a drawback if you only need a functional plastic part, but these artifacts are amplified when the piece is re-created in shiny metal. After firing, the metal is finished with 3 grades of abrasive and polished with a silicone wheel. You can’t miss the giant crack in the back of this buckle. In my eagerness to see the finished piece I de-molded the raw clay too early. I felt it flex as I began, and left it to dry for a few more hours at about 150F. It looked OK when I finally de-molded it–aside from some damage to an ear (oops). Unfortunately the crack opened wide under the stress of the 1700 degree firing process. Not all is lost though as enough integrity remains in the buckle that I hope to be able to fill the crack and achieve a mostly seamless repair. If not I will have not spent too much on the material if you consider the 4 month learning process I got out of it. I’m especially happy to have achieved sturdy and solid connections on the back of the buckle. 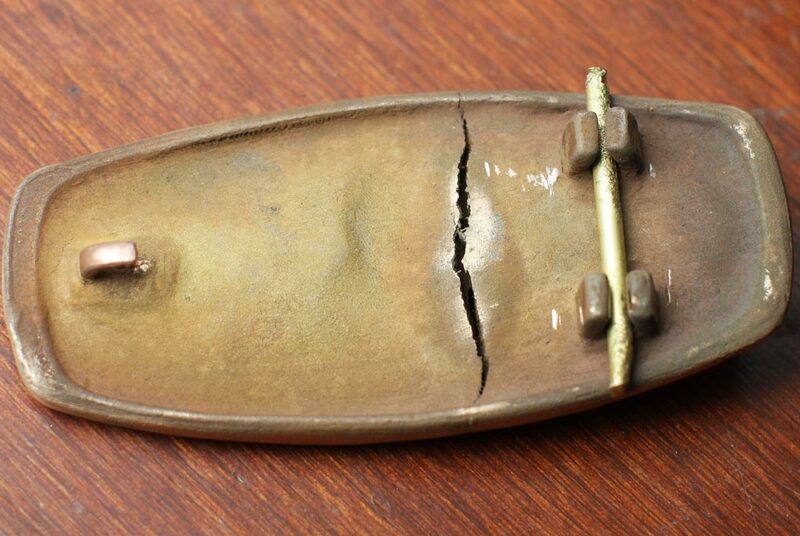 Both the brass embed that creates the hook and the pegs formed from metal clay were an experiment. The brass survived firing well and should hold up to a bit of hammering to work-harden it. The pegs were designed to capture a wire loop to attach to the belt. They held up well to the hammering necessary to capture the wire, as well as the hammering to release it again. All of this is good news, not only for my friend, who stands to get his buckle soon, but for the belt buckles I have in the pipeline for production here. I’ll be back soon with photos of the finished belt buckle. Stay tuned for those along with a whole new line of jewelry which I will be revealing at Maker Faire! I’ll also have lot’s more to say about my modeling process and the tools I use.